The town of Shannon is part of County Clare, on the east coast of the Republic of Ireland. 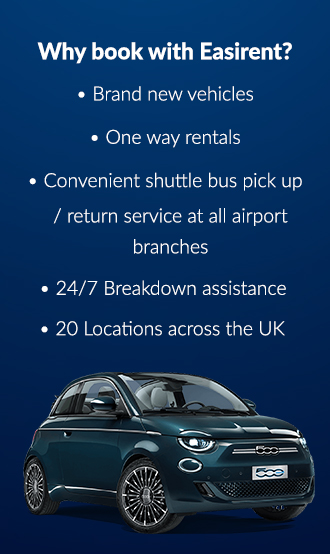 The town provides perfect launchpad for the surrounding county, and nearby towns and villages, and the best way to discover them all is in your holiday hire car. Shannon and its surrounding area is rich in historical significance, and is the location of many important archaeological sites; some of which claim to show the beginnings of early human settlement in Europe. As well as having a wealth of important Irish heritage sites, Shannon and its surrounding areas are home to some of the country’s best loved attractions, and pull in thousands of visitors – both locals and tourists – each year. The Cliffs of Mohar are one of the splendours of the Shannon coastline, towering majestically over the unruly Atlantic Ocean. There are many castles and medieval buildings which hold important historical significance in Shannon, including the Moghane Hillfort and Bunratty Castle. Or, if you’re after a bit of an Irish adventure, the rugged and alluring Wild Atlantic Way is just a short drive from the centre of Shannon. Pick up the route along the country’s east coast and it promises to be one of the most memorable Irish road trips that you can take in your holiday rental car. Whatever it is that brings you to Shannon, whether it’s for business or for leisure, you won’t fail to be impressed by the sheer beauty of Shannon and the traditional and natural Irish landscape surrounding it. Encounter nature in its wildest and purest form at the Cliffs of Mohar. These stunning cliffs are where the wild and brooding Atlantic Ocean meets the west coast of Ireland, and are one of Ireland’s natural wonders. Each year, thousands of people visit the cliffs to breathe in the salty sea air and blow away the cobwebs, whilst taking in the stunning panoramic views offered across the Atlantic Ocean. In 2011, the Cliffs of Mohar were awarded a UNESCO Geopark membership, alongside the neighbouring wonder The Burren. Covering an area of over 530 square kilometres, the region offers a diversity which is second to none, when it comes to local sustainability initiatives, locally sourced produce, farming and a unique ecosystem. Located just a short drive from Shannon International Airport, and close to nearby Galway Bay and Limerick, the Cliffs of Mohar are reached along one of the most beautiful stretches of road in the Republic of Ireland, so it’s definitely worth a visit in your holiday hire car. There is a visitor car park located on the main road, however this can fill up quite quickly when there are a lot of people are in the area. If you want to experience the cliffs in their most natural form, then it’s best to visit in an off peak time – why not book your hire car from our Shannon Airport branch at the same time!. As Ireland’s premier tourist attraction, the cliffs can get pretty busy around the middle of the day and during peak summer times. Beat the crowds and visit the cliffs outside of the popular times, which are 11am – 4pm, and during the summer period between June and August. The most complete and authentic medieval castle in the whole of Ireland, Bunratty Castle dates back to the 1400s, and is home to magnificent collections of tapestries and antiques from the 15th and 16th centuries. Bunratty Castle is built upon an old Viking trading camp originating from AD 970, and the current building is the final of four castles which were constructed here. The present structure was built in 1425 by the MacNamara family – a powerful and well-known Irish family in the area at the time – and it has certainly stood the test of time. Throughout the 1400s the castle sat in acres of beautiful, unspoilt gardens and grasslands, and it is said that it was the home of over 3000 wild deer. Over the following four centuries, the castle and its grounds were passed between families and landowners, until eventually in the early 19th century, Bunratty fell into a state of disrepair. It wasn’t until Viscount Lord Gort purchased and restored the castle in the 1950s, that the castle returned to its former glory. Today the castle is open year-round to visitors who want to learn the history of the castle and its influence on County Clare and beyond. Accompanying Bunratty Castle is the Folk Park – a living, breathing reconstruction of Ireland over a century ago. Set across 26 acres of land, the Folk Park is home to over 30 replica buildings of a time gone by, with each building having been decorated to abide by the social standings of the time. Explore everything from the poorest one-room dwellings to the Georgian splendour of Bunratty house, and catch a glimpse of how the Irish lived over 100 years ago. If you’re visiting Bunratty Castle in your holiday hire car, you’re in for a treat as the castle plays host to a plethora of exciting entertainment throughout the year, including its famous medieval banquets, which take place throughout the year on selected dates. Make sure to book your seat at the table in advance, as the event’s popularity ensures that it’s a sell out every time. It’s worth taking a look on the Shannon Heritage website to see if there are any special offers, as sometimes there are ticket options for around €45 per diner. Getting to Bunratty Castle couldn’t be simpler – hop in your holiday hire car and take the N18 towards Limerick, where you’ll see signs for the castle en route, and you’ll be there in 20 minutes. A complimentary car park can be found on arrival at the castle and grounds, and there is a cafe and gift shop on site, as well as a fully licensed pub. The largest Bronze Age hill fort in Ireland, Moghane (also known as Mooghaun and An Muchan, in Irish) is a short journey from the centre of Shannon in your rental car. Home to around 80 single and multiple-walled facilities, which are now in ruin form, Moghane hill fort is considered one of the most important archaeological sites in the whole of Ireland. Covering several acres, the fort sits atop a 79 metre high hill overlooking the estuary of Fergus. Free to visit (and definitely worth the trip) the fort sits nearby the famous Great Clare Gold Find, an area which, in 1854, hordes of gold were uncovered as the railway between Limerick and Ennis was being constructed. Craggaunowen is described as a ‘living past experience’ and it’s certainly that. Visitors to the attraction will find reconstructed living quarters and reenactments of the Crannog people. Park up your hire car and head into the woods to learn more about the Crannog people, their customs and dwellings. Wild goats, soy sheep, and boar roam the woods as the leather-hulled ‘Brendan Boat’ sits proudly in the banks of the river, which was built by Tim Severin to cross the Atlantic Ocean. This award-winning prehistoric park traces the Irish ancestry back over 1000 years and invites you to discover the roots of the people, as well as the homesteads, animals and Celtic artefacts. Learn about the early hunter-gatherers at the Ring Fort, and see how the Celts cooked their food over open fires and pits, and how they handmade platters, pottery and goblets. There is also chance to explore Craggaunowen Castle, which is a product of the 16th century and sits on a crag overlooking the lake. The stunning views offer unrivalled photo opportunities, so make sure to pack your Polaroid, and you might even get a snap of one of the area’s rare and interesting animal breeds. Admission to the Living Past Experience in Craggaunowen is open from Easter Sunday until mid-September between 10am and 5pm (with last admission at 4pm). After this date the attraction is closed for the season; it is also worth booking your entry ticket online before you arrive to avoid any queues. Malahide Castle and Gardens is one of the oldest castles in the Republic of Ireland and is set within 260 acres of stunning parks and gardens. The stunning 12th century castle has been the residency of the Talbot family for over 800 years, and today welcomes the public through its doors to admire its grandeur. Learn all about the history of this famous Irish family, as you make your way through the beautiful castle, and as you explore the luscious green spaces that surround it. The castle is open for admission all year round, and can be visited between 9:30am and 4:30pm, daily – be aware that the last tour of the castle takes place at 3:30pm each day. The castle has its own website where it takes tour bookings and sells tickets, and it’s a good idea to book yours in advance, to avoid disappointment.